Tom Higgins grew up in the Finger Lakes region of New York. 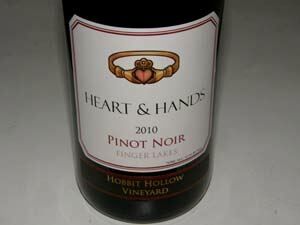 While still in high school, he worked at Hazlitt 1852 Vineyards learning both winemaking and tasting room management. He studied accounting and information systems in college, thinking that the technology field was a great way to make a quick buck and allow him to eventually have his own winery. 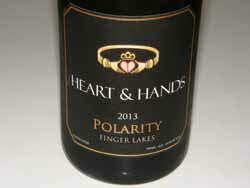 He entered the technology industry during the dot-com boom of the 1990s, and met his future spouse, Susan, who was also a wine lover, while they were both on corporate assignment in Ohio. Tom quickly longed to return to the wine industry and told me, “The tech industry was interesting for a while, but there were just too many 3:00 A.M. ‘emergency’ pages among other irritating things.” He left his job and started working for Zachy’s Wine & Liquor in Scarsdale, New York. This was an eye-opening education into the world of wine. The connections he made at Zachy’s enabled him to work in Bordeaux at Chateau La Lagune and learn old world winemaking techniques. Unfortunately, at the time, Domaine Romanee-Conti already had an intern and Domaine Dujac felt like they had helped enough young American winemakers with their success. 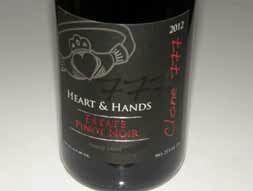 Upon his return to the states, Tom worked a harvest at Calera Wine Company in California. 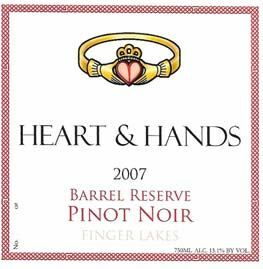 He then ventured back to the Finger Lakes, working for Thirsty Owl Wine Company and Atwater Estate Vineyards, while preparing to launch his own winery, Heart & Hands Wine Company. 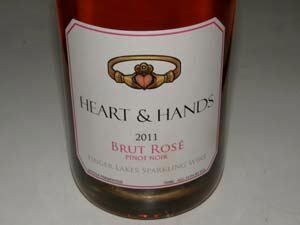 I met Tom at Thirsty Owl Wine Company during a trip I made to the Finger Lakes a few years ago. 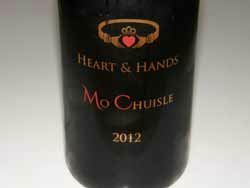 His spouse, Susan spent many vacation weekends in the Finger Lakes and after obtaining an MBA from New York University Stern School of Business, the couple were married and Susan works for a leading management consultant firm when not assisting Tom with winemaking activities. The winery was founded in 2006. A suitable site for a vineyard and winery was chosen on a gently sloping hillside overlooking the eastern shore of Cayuga Lake. 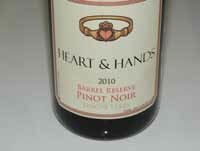 The site is ideal for Pinot Noir and Riesling, with soils redolent of Onondaga Limestone with outcroppings of shale. 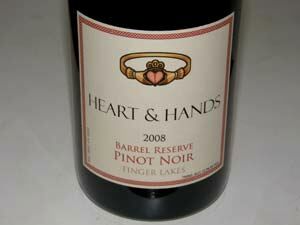 The proximity to the lake and the gently sloping site offer the future vineyard protection from harsh winter weather. In 2008, winery construction was completed and a tasting room opened the following year. 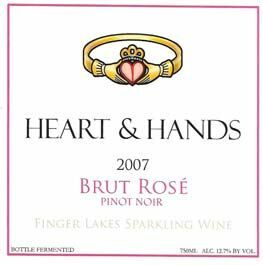 As the 6-acre estate vineyard is developed, Heart & Hands has obtained acreage contracts with several premier winegrowers including Sawmill Creek Vineyard and Hobbit Hollow Farm. 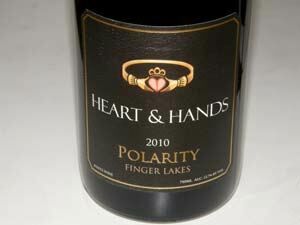 Current production consists of Pinot Noir, Brut Rosé, Polarity (a Pinot Noir Blanc) and Riesling. The Claddagh ring on the label is the traditional Irish wedding ring symbolizing friendship and togetherness (the hands), love (the heart), and loyalty and fidelity (the crown). It is worn by people of Irish descent the world over as a source of pride in their heritage. 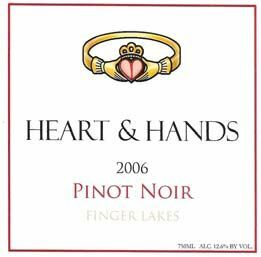 At Hearts & Hands, the Claddagh symbolizes the Higgins’ passion for wine and loyalty to their customers.